Love delicious, gourmet chocolate but hate what it does to your bank balance? With Melt vouchers you can enjoy fantastic savings on a wide range of amazing fresh chocolates, hampers, sweet snacks and more. So whether you're tempted by truffles, crazy about caramels or dotty about dark chocolate, Melt coupons will help you to indulge your passion without breaking the bank. Melt started life in 2006 when founder Louise Nason – a mother of four – sought to create the very best chocolates from the finest ingredients the world has to offer. With flagship stores in London's Notting Hill and Holland Park, Melt's amazing chocolates have won fans around the world. Today, they employ a team of world-class chocolatiers to make all of their chocolates by hand, carefully wrapping them and sending them to thousands of satisfied customers. In their stores, Melt operates open plan kitchens where customers can see all the chocolates being made and learn more about the fascinating world of luxury chocolate. Online, customers can browse Melt's wide collection of chocolates and hand-pick a selection to suit their individual tastes. Got a favourite chocolate you want to treat yourself to? From gourmet sea salted caramels and dark chocolate truffles to pralines, fruit-filled chocolates, white chocolates and more, there really is something for everyone. Not sure what to choose? They also offer a choice of pre-selected boxes that cover everything from seasonal treats to some more exotic selections. What's more, the selection changes on a regular basis – so there's always a new favourite to discover. At Melt they believe that finely-crafted chocolates are a thing of beauty, and design all their recipes in-house to reflect the very best flavours around. All their ingredients are sourced from companies committed to supporting the local community and the environment, and all their chocolates are made fresh before being skilfully packed and delivered to you in the fastest time possible - ensuring that you can enjoy Melt chocolates at their very best in the comfort of your own home. There's even an exclusive 'Melt Club' options which allows customers to enjoy a special monthly box of chocolates – plus exclusive discounts, freebies and more – for a small price of just £19.99 a month. Want to treat yourself with Melt? With Melt vouchers you can enjoy fantastic savings on their wide range of luxury hand-made chocolates. So whether you're a committed chocoholic or just starting to discover a love of unique, quality chocolates, Melt voucher codes will save you money while you shop. Flagship stores in Notting Hill and Holland Park. Browse our website until you find a Melt vouchers that suits you, then navigate to their website to begin shopping. When you've finished shopping, click 'Check out'. Enter your Melt coupon in the box provided and click 'Apply'. If you've enjoyed shopping with Melt, you might also like to check out more great deals on gourmet chocolate treats at stores like Thorntons or Hotel Chocolat. Or, if those aren't right for you, you'll find plenty more stores to browse in our Food and Drink section. Enter your Melt vouchers in the box provided and click 'Apply'. Choose a delivery method and click 'Check out'. Review your order and click 'Check out'. Standard UK delivery costs £6.50 on all orders, with next day delivery available for £15. Need to contact the team at Melt? Whether you have a question about your order, want to find out more about gourmet hand made chocolates or simply want to find out how you could save money with a Melt discount code, you can contact the Customer Services department by telephoning 0207 727 5030. Want to find out more about what's happening at Melt? The company maintains a profile across all your favourite social media sites. Follow them for lots of exclusive content including promotions, competitions, chocolate news, new product previews and much more. You can also use these pages to find out more about saving money with Melt discount codes. Don’t forget to check them often, as you can never be sure when a free Melt promo code might be waiting for you! 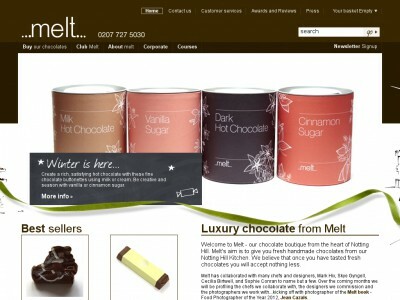 Buy now online at www.meltchocolates.com. Like most women I'm a chocolate-obsessive, but my habit can be hard on my bank balance sometimes. That's why I was happy when I discovered some Melt vouchers online. With a Melt coupon I can get great deals on the wide range of gourmet fresh chocolates available at meltchocolates.com. I used my Melt voucher codes to save money on my final bill when I treated myself to their special truffle selection – a real treat!